This book provides comprehensive information about the water resources of the Arabian Gulf region, an area that is symbolic as an arid to extremely arid belt. Filling an information gap it provides in-depth analyses of both natural and human-related constraints on water resources, and presents a new vision on efficient management of available water resources. It contains an overview of the physical geography and climatic constraints on water resources, systematic inventory of available traditional and non-traditional water resources, water-related problems, water conservation and legislations, comprehensive water laws applicable to the region, and modern techniques of water resources investigation. This work meets the needs of scientists, environmentalists, engineers, planners and decision makers. Senior undergraduate, graduate students and researchers of the Gulf area, and more generally of arid regions, will also find this volume valuable. Preface. Acknowledgements and Copyright Permissions. 1. An Introduction to Water Resources in the Arabian Peninsula. Introduction. Water losses. Dams for water conservation and protection. Water resources. Water consumption. Scope of the volume. 2. Physical Geography of the Arabian Peninsula. Geomorphology. Vegetation and water. Climate. Temperature. Precipitation. Wind directions. Relative humidity. Evaporation. 3. Geology of the Arabian Peninsula and Gulf. Introduction. The succession of Tectonic events. Arches/Paleohighs and basins/depressions. The stratigraphic and sedimentological framework. 4. Aquifer and Aquiclude Systems. Introduction. Precambrian-Paleozoic aquifers and aquicludes. Mesozoic aquifers and aquicludes. Cenozoic aquifers and aquicludes. 5. Hydrogeochemistry. Introduction. Hydrogeochemistry of rain water. Hydrogeochemistry of spring water. Hydrogeochemistry of falaj water. Hydrogeochemistry of groundwater. Water salinity variation. Results of hydrogeochemical analysis. 6. Traditional Water Resources: Springs and Falajes. Introduction. Springs. Falajes. 7. Non-Traditional Water Resources: Desalination and Treated Wastewater. Introduction. Desalination processes. Economic constraints. Environmental impact. Security problems. Treated wastewater. Contributions of treated wastewater to total water demands. Advantages of wastewater reuse. Potential of treated wastewater. Guidelines for wastewater reuse. 8. Case Studies on the Hydrogeology of the Cenozoic Aquifer Systems in the Arabian Peninsula. Cenozoic hydrogeological system. Cenozoic aquifer system of Kuwait. Cenozoic aquifer system in Saudi Arabia. Paleogene aquifer system in Bahrain. Tertiary aquifer system in Qatar. Quaternary aquifer system in United Arab Emirates. Cenozoic aquifer system of Oman. 9. The Legal Basis for Groundwater Protection in the Gulf States. Part One: An introduction to Islamic law applied to water. Part Two: Summary of the legal situation in the Gulf States. 10. Towards the Development of a Water Policy Management. Introduction. Water resources. Water policy. Water demands and supplies. Water resource assessment. Principal water sources. Conservation on water supply. Water legislation. Projected energy conservation (towards a partial solution). Future conservation policy and rational plans. 11. Numerical Modeling of Certain Aquifer Systems in United Arab Emirates, Saudi Arabia and Kuwait. Introduction. Groundwater-flow model of the Wadi al Bih aquifer, Northern United Arab Emirates. A geochemical model of the Wadi al Bih aquifer, Northern United Arab Emirates. Groundwater-flow model of the Dammam aquifer in Saudi Arabia. Groundwater-flow model for the Kuwait aquifer systems. Groundwater-flow models of the Quaternary aquifer system, United Arab Emirates. References. Subject Index. Appendices. @from:J.L. 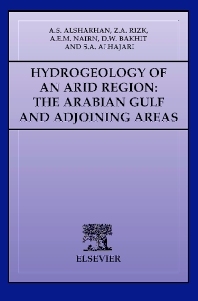 van Rooy, University of Pretoria, South Africa @qu:...The very specific nature of the hydrogeological conditions on the Arabian Peninsula makes this book highly informative, but with somewhat limited application to other areas excluding the very arid regions of the World. The approaches and management policies set out in this book may be of great value in these regions.